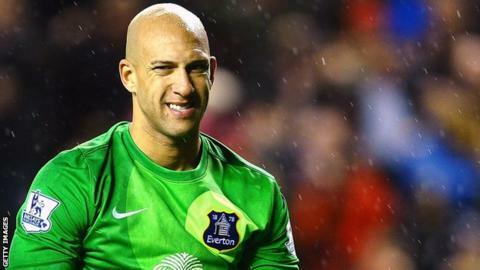 Goalkeeper Tim Howard thinks Everton fans were wrong to boo former manager David Moyes on his return to the club with Manchester United on Sunday. The Scot, making his first visit to Goodison Park since leaving for United last summer, was barracked throughout the Toffees' 2-0 victory. Howard said: "We have brilliant fans, but that was unfair on him. "He was the second coming, the messiah 12 months ago, and I don't think as Evertonians we should forget that." Moyes was given a warm send-off in his final game in charge last season after 11 successful years as Everton boss. But he angered fans with his attempt to sign Everton's Leighton Baines and Marouane Fellaini on the cheap during the summer. Howard, who agreed a two-year contract extension last week, was signed by Moyes from United in 2007. "I love David Moyes. I think he is a brilliant manager," said the 35-year-old American. "He was (a brilliant manager) here for us and I will be forever grateful to him."